As I mentioned yesterday, the morning weather in Charlotte has been unbelievable for some outdoor workouts. I’m cleared to run again, so I over the past three weeks, I have been easing back into a comfortable pace. On a good day, prior to being sick, I was running a 7:30 mile pace over 3-4 miles. Post sick/vacation, I am running 8:45-9:00 minute miles. I will probably not be the first to tell you that expecting yourself to be at the same physical level after several weeks off is not realistic. Trying to get back to that place too fast can result in a serious injury. 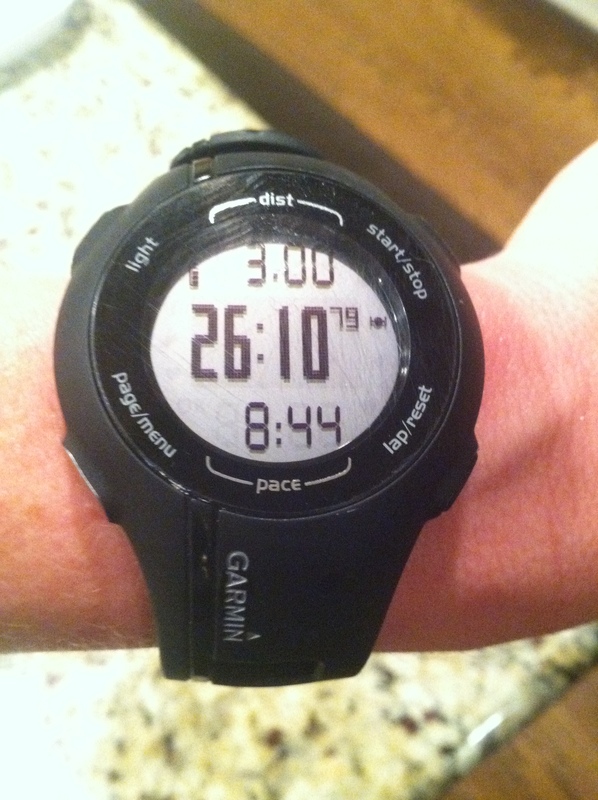 This morning’s run was three miles at a perfect tempo. As my watched beeped after each mile, I looked down to see my mile split hovering right at 8:45. Nice and relaxed. I followed up my workout with a few exercises using body weight and a power band. 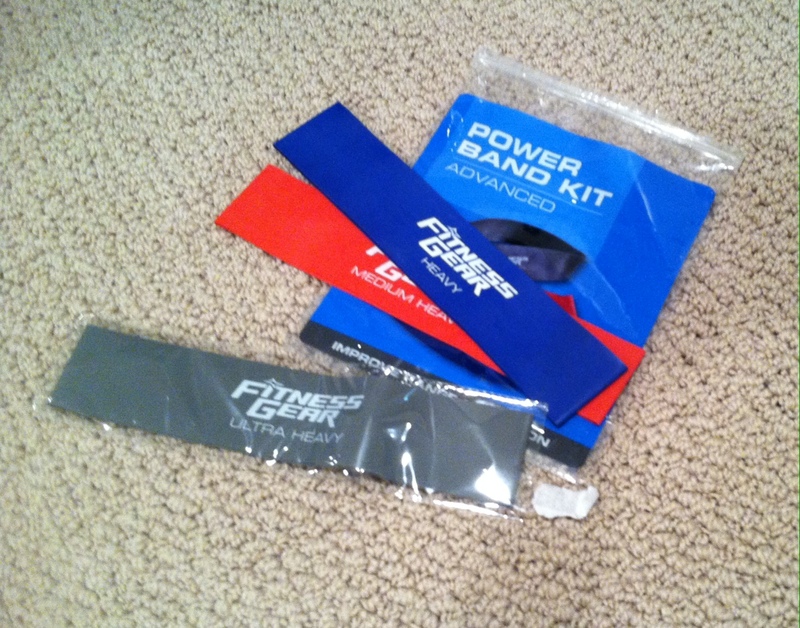 These bands are awesome for targeting core muscle groups while building strength at the same time (they are also cheap!). These exercises don’t take long to do and are great for building core muscles to not only make your running better, but they can also help prevent injury. I ran through the following exercises sequentially, doing 30 reps each. I then repeated the sequence of exercises doing 20 reps each (for a total of 50 reps). Toe Taps (no band) – Knees raised to 90 degree angle, shins parallel to the ground. Lower your legs SLOWLY, until your toes tap the ground. Slowly raise your legs back up to start. Hip Raise w/band – Lying flat on your back, knees bent, feet flat on the floor, place the band around your quads. Raise your hips until your body forms a straight line from knees to shoulders. As you raise your hips, make sure that your knees stay in the same position by slightly pressing the band apart and engaging your glutes. Lower to start. Squats w/band – Again, place band around your quads. Lower into a squat while squeezing the band outwards. Return to start. Plank w/leg raise (no band) – Holding a plank, raise your right leg, and then lower it back to start. Repeat on left side, alternating sides. Complete 30 each leg. Ankle Taps (no band) – Raise yourself up in a standard crunch position, alternating tapping your right and then your left ankle. Make sure that your feet are not too close. Make this hard! Reach. Dips (no band) – I literally did these off the side of my couch. Side leg raise w/band (30 each side) – Lying on your left side, place band around the bottom part of your shin. Your right leg should be elevated at the start so that there is no slack in the band. Raise your right leg 1-2 inches higher (stretching the band) and lower back to start (remember don’t let the band slack). Whew! Within 40 minutes, I got a good cardio/core combo workout in. Fuel time! 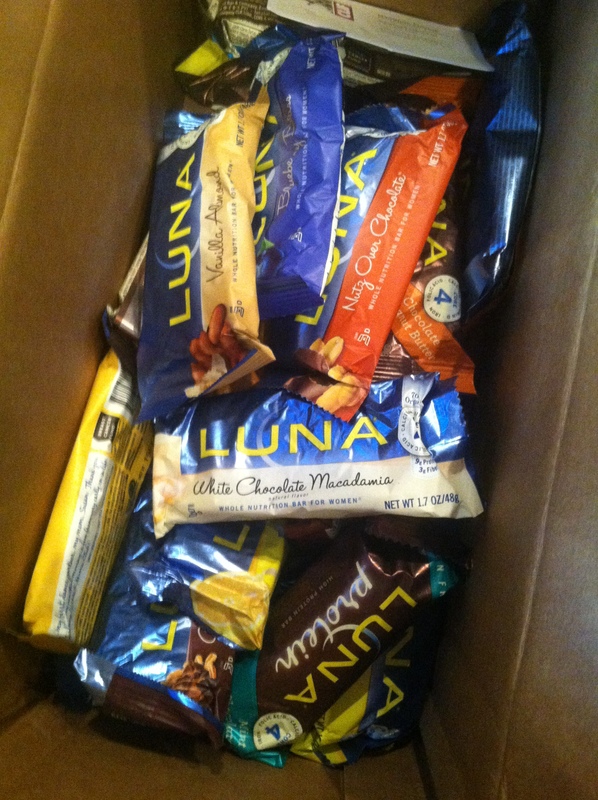 I mentioned last week that I had gotten a big sample box of new Luna bar flavors compliments of Clifbar. Let me talk about my first bar! I threw a few in my work bag to put in my desk drawer. Any of these bars are a PERFECT snack to hold me over during the work day. Victim #1 was the Blueberry Bliss bar. When I typically pick out a nutritional bar, I like to go for chocolate. I have a soft spot for chocolate, so I will be the first to say that I would likely never pick this flavor if I was going shopping at the grocery store. Coincidentally, I also have a soft spot for Pop Tarts, but I know how bad they are for me, so I only let myself buy them a few times a year (before I shamelessly throw half the box away when they go stale). This bar solved two problems! No joke, dare I say this thing tastes as heavenly as a blueberry Pop Tart (and I don’t have to buy a whole box!)? So no throwing away? The bar is by far healthier for me than a Pop Tart. Get this. 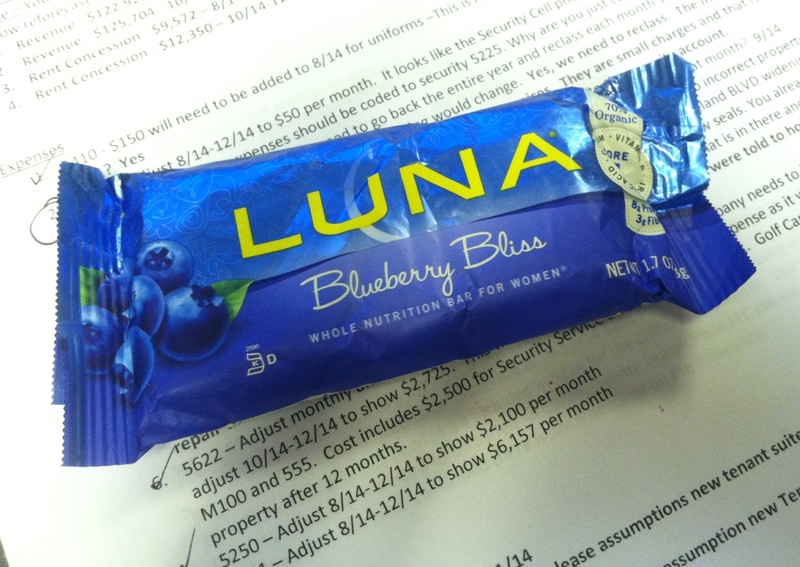 Luna Bars are 70% organic. They are also high in calcium and folic acid (hence why they are good for the ladies). We all need a lot of this. Especially when we are pregnant! Did I mention 8 grams of protein and 3 grams of fiber? You have completely lost the taste of those bland protein bars and fiber bars and replaced it with an almost entirely organic treat. I highly recommend! 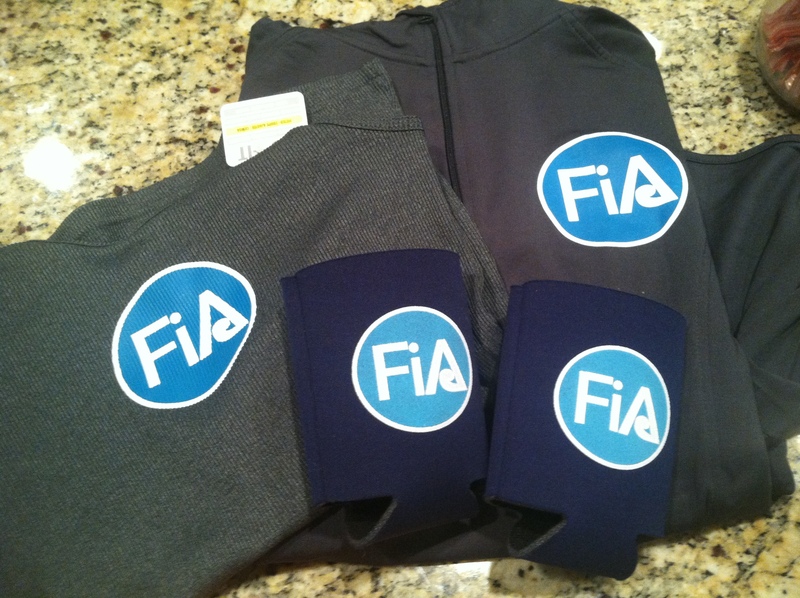 I mentioned it earlier in the week, but I actually physically got my new FiA gear! Under Armour pullover, tank and some koozies just in time for tailgating season! This logo is going to be all over Charlotte just like F3 soon. Get there! This entry was posted in food, running, workout and tagged Blueberry Bliss, charlotte, Luna Bar, Power Band, Power Systems, running on August 27, 2014 by flyjenduf.